Will Lawsuits Make Aereo's Free Cloud TV DOA? Just two weeks after Aero opened up shop, a few broadcast TV networks are already trying get the cloud-based TV service shut down in the courts. ABC, PBS, and Univision are amongst a group of companies suing to prevent Aereo from letting you capture the airwaves. 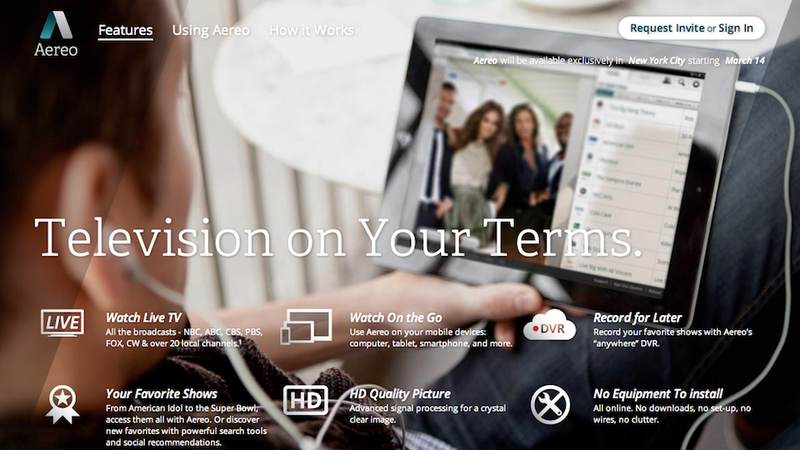 There have been questions about Aereo's legality from the start, and now it's getting a test. So far at least two groups of broadcasters have filed complaints against Aereo. The fundamental question at play? Can Aereo capture free TV from the air for you like a DVR and then post it to the internet so that you can watch it from your computer, your phone, or anywhere else, without violating copyright law. In their complaint against Aereo, the broadcasters argue, "It simply does not matter whether Aereo uses one big antenna to receive Plaintiffs' broadcasts ... or ‘tons' of ‘tiny' antennas .. No amount of technological gimmickry by Aereo or claims of sophisticated ‘rabbit ears' change the fundamental principle of copyright."